To celebrate the Chinese New Year Givenchy came up with this gorgeous limited edition collection which features their best selling shades dressed up in a beautiful red and gold packaging. I absolutely love this collection because these are my favorite products from Givenchy and they look stunning in this packaging. It features Prism Libre and Le Rouge in 305. 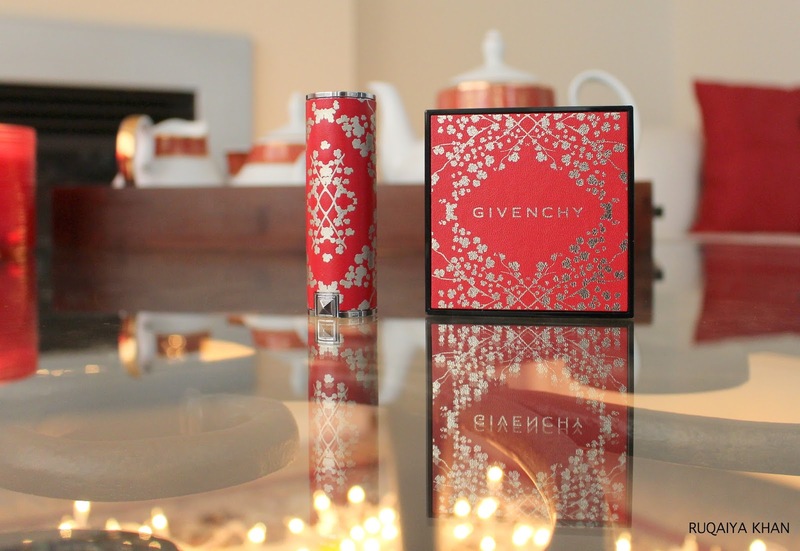 I am a huge fan of Givenchy lipsticks and I can't wait to share it with you. For review, swatches and lots of pictures keep reading! Le Rouge in 305 is a bright warm red shade that sets the mood for the celebrations. In this red and gold limited edition packaging, it is reminiscent of firecrackers used as decorations (hopefully) during the festivities. The real leather looks stunning in red with golden flowers. Givenchy has truly captured the essence of the Chinese New Year with this packaging and the shade selection is apt for the occasion. If you love red lipsticks, you don't want to miss this one because it is a perfect shade for spring/summer time. Rouge Égérie pulls more coral on me and looks like a coral pink in the swatches below, but its definitely much more red than pink. Its one of those shades that look different in different lighting and I personally loved it during the day time, when the red tones are its brightest. It looks beautiful and the creamy texture of Le Rouge is to die for. Its a semi matte lipstick with intense pigmentation and longevity. It stays on even after a meal and never looked patchy on me. I am very impressed with this shade because it works so nicely on my skintone. The warm red shade is perfect for the Chinese New Year celebrations. This stunning limited edition packaging just adds to the festival vibes and puts me in the mood to celebrate. This matte finish, natural looking loose powder is the perfect finishing touch to my makeup look. The red casing with gold accents look like gold embroidery on a red silk garment. This beautiful packaging is practical, compact and easy to use. The attention to detail is incredible on this one, as you will notice that even the black ribbon on the powder puff is adorned with gold flowers. This limited edition packaging is in the shade Mousseline Pastel , which is a universal shade in my opinion, that works for most skintones. It beautifully sets foundation and adds just enough radiance to keep the look natural so it doesn't look 'flat'. The powder puff can be used for application, but I prefer to use a big fluffy brush to swirl in all four colors and apply if all over my face in circles. It adds a lovely glow and color corrects where need be. I notice the most difference around my lip area where my foundation seems to breakdown the most and this helps not only in blurring out imperfections but also makes foundation last longer and keeps it looking matte and natural the whole time. Absolutely love Prisme Libre and I would highly recommend you to try this powder for setting your makeup, color correction and to add a lovely radiant glow to your complexion! Overall, I absolutely loved these products. They make wonderful presents and if you're already a fan of the Prism Libre and the Le Rouge, then you must grab these in this limited edition packaging. The Givenchy Chinese New Year Limited Edition Collection launches on Jan 5th, 2018.